Part of the fun of being retired is trying new activities and hobbies. Today I took a beading class here in Palm Creek RV Resort. What fun!! We chose our primary beads, the focal bead, and the accent/spacer beads. 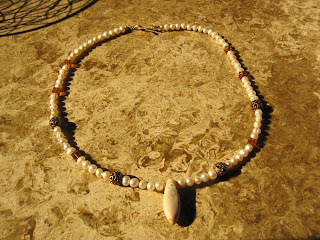 In my case, the majority of the beads were fresh water pearls with some amber colored square beads and round antiqued looking metal beads. 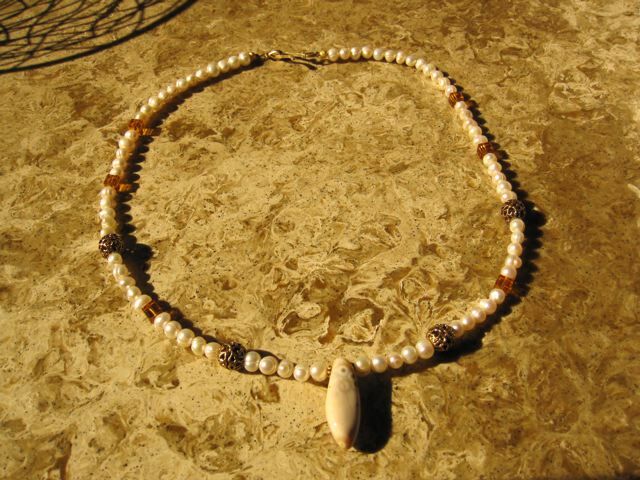 The focal bead is a stone with some swirly stuff and a little color in it. I really loved seeing how it all came together and I can't wait to research more and maybe go to Tucson to the annual gem show. Uh oh - going to have to add beading to my list of hobbies!! You are so crafty! Can't wait to see what you come up with next! I'm a "Grits" (girl raised in the south) transplant to the Pacific Northwest (Belltown, Seattle). I love to eat, cook, knit, and read - in that order. I'm really good at eating, cooking, and reading. Not so good at the knitting thing, but it soothes my soul. Just recently discovered paper crafting - what a blast!! Currently touring the country with my newly retired hubby in an RV. Just an update - we are now traveling in our coach "full time" although we will winter in Casa Grande, AZ. We've Moved to Cardz TV! !